Sometimes it feels like we have books in every corner of our house. It's not true though. We sometimes have books on the boys' shelves and in use in their various work spaces, there are always books in this above little book unit and next to the boys' bed. Here we have Animalium, World Atlas (this almost never leaves the shelves), a Space Encyclopedia (so popular after following the recent New Horizons images of Pluto - it's nice to have science feature so prominently in news and current affairs), The Animal Book (another favourite by Steve Jenkins - we love the part about evolution and the story of life near the back), Dark Emperor and Other Poems of the Night (I love the art work in this, it's relief/linoleum print, and it ties in so well with Otis' nocturnal work! ), Actual Size (another by Steve Jenkins) Nature's Day and our newest addition Before After (great graphic design work!). We usually have a nice children's coffee table book. This is an old favourite with really amazing photography. Children of the World: How we Live, Learn and Play in Poems, Drawings and Photographs - this is really relatable for my children, I love the format. Having coffee tables books is a really nice way to display special books and I love the look of (children) visitors when they find a nice book out like this. And we always have books in baskets. The basket to the left often contains smaller books (that are too small for the top book unit) sometimes first readers and board books. The red tin to the right often has Caspar's chapter books but also children's magazines (we have lots of Anorak and National Geographic). Because I am often asked - all books out of rotation are accessible to the children. We store books in our downstairs guest bedroom which has shelves in the built-in wardrobe. Please feel free to join in the link up! Share your Montessori inspired shelves from your blog or Instagram below. Our art area - how it is inspiring us! There has been a huge shift in the amount and variety of art we have been creating since setting up our art nook. The biggest change is the location where the children are doing art. I'm thinking an art area needs to be super accessible (and it wasn't before). There are many times Otis doesn't want to help in the kitchen but can work in this area and still talk to me while I am preparing meals or snacks (Caspar can work elsewhere as he doesn't need as much supervision). Otis is also being super clingy right now so it's nice to have him close. Our art shelves are all open and it's so easy for my four year old to get every single thing he needs. It's only going to delay the child or wear off some of their enthusiasm if they need to wait for an adult to help. I have allowed this area to get a little messy while still teaching the children how to maintain and respect the materials and making it work. I love water colours but we have been starting, because we now have the space, to use other paints and materials. The above paint station is fabulous because the paints are rich in colour (it's tempera) yet so contained. Otis just carries it from the shelves and it's all there. Honestly we should have been using tempera paint years ago! I can also see the tempera discs are really going to last. Sponging has also been a huge it. Often Otis uses it to bend colours which looks amazing. Otis has been on a breakfast strike (for almost two weeks now, I could really do with a degree in child psychology) so I've been cooking breakfast and trying to be more creative and therefore spending more time in the kitchen in the morning. Otis gets dressed and comes out to create first thing after waking. It's so peaceful and lovely. Hopefully a really centring way for him to start the day. The light is so pretty too and really different to any other time of the day. Our table top easel has made a huge difference too. I'll often leave it stocked with paper or the occasional canvas. Otis finds it irresistible. We didn't bring our large children's easel with us when we moved from Canberra (it had been outside and our dog had chewed the legs). I'd been looking for a great table top easel and this one works perfectly! I love that it looks really artsy when visitors come. It's easy to fold and put away and it doesn't take up much space. Otis or Caspar can use it sitting or standing (or carry it on the deck or outside) and they can change the paper themselves. It will hold all size canvases. It's fabulous and I wouldn't part with it. Looking through these pictures I can see how important painting can also be for promoting and exercising good pencil grip. Only a week ago all of Otis' people had arms and legs coming from the head. I love to see how his people have progressed - now having a tummy, hands, feet and more facial features. Luckily this picture is for me because it's going on the wall! Although it is c/o I've had my eye on the Table Top Easel (regular price $47.99). Paint station and Table Top Easel are ℅ Child.com.au. Child.com.au are offering 15% storewide until July 31 2015. Use promotional code INTRO15 at checkout. Child.com.au is a new and exciting Australian online store that is parent focused and has so many of the educational supplies we love. Some gorgeous, mostly Montessori finds that I am loving on Etsy. Nature Themed Play Dough Set by Montessori Restore. Lots of materials for play dough - or cooking. Lots of ideas here! Modern Child Table Set by Jesse Lee Designs. This is gorgeous - so, so lovely. Cotton Montessori Placemats by Natura Baby (who also make cube chairs). Handmade Sewing Kit by Cobble Works. Adorable! This would be a gorgeous gift. 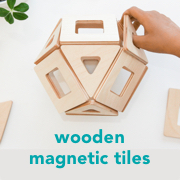 Check out this store for other lovely handmade Montessori materials. Rainbow Pure Wool Hand Knitted Balls by Indigo Inspirations. How perfect for a Montessori baby! Montessori Palmer and Pincer Grasp Cylinders by Montessori Wood Works. Montessori Anatomy of the Heart Puzzle by Montessori Wood Works. I can't tell you how much I love this! Breakfast Board - Pig Shape by On Woodland Road. More Waldorf than Montessori but I love it (Otis is on a breakfast strike, would he eat breakfast if it was on this?). We have used lots of different Montessori sewing trays. Each tray or basket has focused on one activity or one skill such as needle threading or sewing buttons. This is our first real 'sewing tray', one which the child can use the materials and sew as they wish. Use running stitch on the linen in the embroidery hoop, sew buttons onto the felt, sew buttons onto the linen, sew felt pieces together, sew felt onto the linen. There is a limited range of materials available however the child has scope for creativity. For classroom inspiration this is a really beautiful tray at Montessori Design by Nuccia. Examples of our other sewing work include; Some sewing (Montessori Practical Life) Projects, Montessori Sewing - Preparation/Isolated Activities, Sewing on Buttons, Hand Sewing, Rainbow Wool on Burlap, Sewing Cards for Toddlers and Montessori Sewing Ideas. Everything about writing letters to friends is good and heart warming. While Otis loves his letter writing tray he also loves using our old typewriter. Otis can use letter recognition and copy my writing (we are only talking about a couple of words) or Caspar will sit and help him. This is fantastic for his literacy skills. We end up with lots of little letters and notes to friends. It's really sweet coming from a four year old. These letters are to his two closest friends. I love stationary and feel we can never have enough fun stationary and stickers. The green apple and pizza stickers above are scratch and sniff and are totally amazing. Sometimes with his letters he will draw or use his made up writing but today it was stickers. We have lots of art work hanging around - most of these are from the weekend. Firstly I asked Caspar if I could use some of his paintings to make envelopes and then Otis offered some of his. I loved showing them how to do this - not only is it fun and colourful but it's also recycling. We use a template (available at the bottom of the post) to make the envelopes. We use label stickers to provide some white space on the front to address the envelope. Sealing with a sticker and later some colourful washi tape! It's all part of the process. Here is the template we use for the envelopes. I print the template on A4 card and cut it out. Then we trace around it on the back of the artwork, cut it out, fold on the dotted lines and glue leaving the top flap open. Insert the letters and seal. I hope you enjoy! I love to get my children's brains going, I love to see them think in different ways. I like to get those neurons firing! Online I have seen many visual perception exercises but when I tried to track them down they were all overseas (not in English) and expensive workbooks to get here. So once I tracked down some resources that are accessible I thought I definitely need to share them. Firstly though - what is visual perception? Visual perception refers to the brain's ability to make sense of what the eyes see. Visual perception is the ability to interpret the surrounding environment by processing information that is contained in visible light. Visual perception can help with reading, writing, puzzles, cutting, drawing, mathematics and many practical life activities. Visual perception is made up of some of the following skills, which are addressed in some of these activities. Spatial Relationships - Understanding the relationships of object within their environments. The ability to identify the position of two or more visual stimuli in relation to oneself and/or in relation to each other. Figure Ground - The ability to locate something in a busy background. The ability to screen out irrelevant visual material when presented with a lot of visual information at one time. Visual Memory - The ability to recall visual traits of a form or object. The ability to remember what is seen for immediate recall. It involves forming a mental image or picture or the characteristics of any given image once the stimulus has been removed. Visual Closure - The ability to know what a form or object what part of the picture is missing. The ability to recognise any given visual stimulus from an incomplete presentation. Visual Discrimination - The ability to determine differences or similarities in objects based on size, colour and shape. One of the great things about the resources we have found is they are progressive. They start at the basics for toddlers and continue through to the complex for much older children. Observing my children work made it easy to see where they were at. 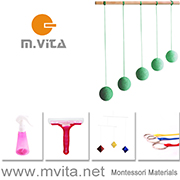 In the Montessori classroom many of the sensorial work includes visual perception skills. These are not Montessori activities however they are activities that as a parent I found really stimulated my children - really got them thinking. My children also found them engaging but I think that is about finding that sweet spot where the work is not too hard and not too easy. This activity above is like many Montessori type matching activities. Matching the animal to a close-up or skin or feathers. With this BambinoLuk system the child moves the top tiles and places them on the matching or corresponding bottom image. Once flipped over the tiles make an image which works as a control of error. Above left is matching butterflies - however the bottom butterflies are orientated differently. Above right is matching coloured rods - however the rods are orientated differently and are also crossed over. Otis at four needs to concentrate a lot for these two and finds them challenging. Above left is matching objects to different perspective, the top images are from an aerial/top position and the bottom tiles are from a side position. To the right is a drawn image at the top to be matched to the same image below although the bottom image has a background and is in different colours. These two above are of the MiniLuk system. To the left is identifying the individual shapes in the image. The right is working out of three images (in each group) which is the odd one out. Although we are not a worksheet family I think these have some appeal and some of these are very similar to worksheets Caspar has used at school. Perhaps good for a rainy day. If you have some fun visual perception exercises that you have used at home please feel free to share. Have you used the BambinoLuk or MiniLuk system? It's so different (in a really good way) to what I expected. Thank you to The Pinay Homeschooler and Indonesia Montessori for sharing their MiniLuk experiences with me. BambinoLuk and MiniLuk are also available in Australia at Fun Start for Kids (BambinoLuk here and MiniLuk here). All worksheets are by Visual Learning for Life (UK) but accessed from Teachers Pay Teachers. The very top Positive/Negative Image are a print out I made by searching for black and white images then reversing the colours. Art shelves are always so lovely to look at. Always so colourful and full of texture. We still have most of our art supplies downstairs (you can see a bit of the shelving here) however we have created a little art nook upstairs which is smaller in size and really only contains what the boys are using. I can see (supervise) this area from the kitchen so it gets used a lot. It is so important that we use restraint here. I could easily fill this area ten times, but the boys would get overwhelmed - this area is for them to be able to find and look after the materials they are most interested in right now. I cannot stress how significant it has been for us to have a dedicated art table (they also use it for letter writing and other crafty endeavours). The boys can paint, use clay, spray watercolours and I am not stressed. When the boys are working on other activities or reading a book they need a super clean surface. Good books and art tables do not mix. A dedicated art table has meant little spills, drawing off the paper, clay everywhere is pretty much a non-issue. And they can leave their art there for as long as they want - which is great with clay as this is often an all day affair. No problems and no interference with the rest of their learning or with the rest of the family. Also I've stopped being concerned with scratching or staining the table - it's an art table, it needs character. Ferby pencils, crayons, sponges (for painting), wooden discs (these have holes for threading), paper paste, charcoal, natural and pink jute twine (for threading and hanging materials), strong/tacky glue (for collage), small wooden pegs and paint brushes (for paint and glue). Whenever I am in Ikea I always get a set or two of their paint brushes - love how soft they are and the various shapes/sizes. The paint centre on the top right has tempera paint with the water in the middle. This is new (we hadn't used tempera paint before) and has been a huge hit, it's so handy for Otis to get out and use (it has been used daily but looks fantastic after a quick wipe over with a damp cloth). The second shelf has a clay tray with clay and tools. This work is mostly done in the tray especially if water is added. We have natural wooden beads for threading (Otis is in a huge threading stage), natural tone pastels (a nice relief from the standard rainbow colours), coloured stocking pieces (for collage and so much more). To the right of the stocking pieces (as above) are A5 pieces of wood - these are the base for our natural and heavy collages - another fantastic idea I picked up recently. On the very bottom shelf to the right is a tray with leaf shaped colour diffusing paper and spray water colours. My next revelation in putting together this area together is these little drawers from Ikea (you can also get them in 2x2). We need so many more! They are the best idea ever for holding collage materials! We have been working a lot on collage with natural materials - think wood pieces, feathers, gum nuts and seed pods, mini pinecones, mosaics and glass tiles. Otis pulls out which drawers he wants and returns them when he is finished. I love the timber minimalist look. You can see the art centre at our previous house (and when the boys were younger) here. Paint centre, branch cuts, mini pinecones, thick twigs, feathers, strong craft glue, colour diffusing leaves and table top easel are c/o Child.com.au. Now it's your turn! Please feel free to join the link up and leave a link to your blog or Instagram. I would love to see your Montessori inspired shelves, baskets, trays or activities! I don't often write about Caspar. He is seven years old and loves Minecraft and Soccer. His needs are pretty simple. However as he is in the sensitive period for culture (I haven't read about this but have noticed - I don't really know if there is such a thing!) I thought I would highlight a lovely product that we have been sent by The Adventurous Mailbox which taps into this interest and helps to meet his need to know more about the world around him. Caspar loves learning about culture but in context. This makes sense right? It's how children learn. He doesn't want facts but a story. He wants to be engaged. This is why learning about culture through food is always such a hit! The Adventurous Mailbox sent Caspar a package including the eight pictured books. First I should mention the packaging because it really is a highlight. It's also why this set would make a truly special gift for a child. The package comes from overseas, it comes in a large brown envelope, ours was addressed specifically to Caspar with all the fascinating international postage stamps and stickers attached. Caspar was beyond thrilled to find it on our doorstep! The package includes a letter, a secret code for accessing the website, the book set which is again presented in a blue international postage type box. The letter sets the scene but it's the books that do the talking. The books are based around a fictional character who moves regularly internationally. It's really about all of their adventures and the adventures of their family and friends in all these different lands. The story is told in the voice of the child. The books tie in so well with cultural and geographical studies (would be so good for homeschoolers!). Each book is set in a different country which has a map at the start, story in the middle and some facts (location, population, flag, language, religion, culture, people, food, animals, customs) about the country at the end of the book. The text is recommended for children 8-12 years old. The main character in the book is twelve. Caspar has good reading skills at seven and can read the books independently but cannot read a lot in one sitting. This is the kind of book you can read out loud and over several days. I would recommend The Adventurous Mailbox for children seven and up - possibly from six for a child with very good reading and comprehension skills. I could easily see a child of 12 to 13 still very much enjoying this especially if they have travelled or have a sense of adventure. The books contain a lot of humour and Caspar certainly found it engaging and entertaining. The books have pictures throughout which are lovely and have a sense of authenticity to them. The value I believe is in the books and in the story. The effort, the knowledge and obvious expertise that has gone into writing the books as they are so rich in culture, customs and language. The Adventurous Mailbox has a parents/teacher's website including a teachers lounge. I have been through the workbook with Caspar for book one and he was mostly interested in the crossword but the workbook is full of comprehension and worksheets. The workbook is thorough and has teacher notes. The children's website has areas still under construction - there are games coming, there is a forum however on the site Caspar was mostly interested in the character blogs - the first blogs he has ever read! The character blogs contain some interesting photographs and stories but nice and short. The Adventurous Mailbox is an excellent resource for children from seven and up, especially those interested in culture, travel and adventure. It would make a delightful gift and would provide many hours of activity - ideal for the school holidays or homeschooling students. I can also see how well this could work in the classroom! Thank you to The Adventurous Mailbox for this wonderful gift. For How we Montessori readers The Adventurous Mailbox has a special offer. The Adventurer Package is regularly $79 USD including shipping (this is less than $10 per book). To receive $10 off the Adventurer Package and free access to the Teacher's Lounge (regular price $20 USD) use the coupon code: MontAdventure (valid until 31st August 2015). The Teacher's Lounge upgrade needs to be in the shopping cart for the coupon to work and no other coupon codes can be used. Please let me know if you place an order - I'd love to know how your children find it. I don't think about childhood development as much as I did when Otis was a toddler. However every now and then I think 'wow' I haven't seen you do that before - 'that's new'. We know through Montessori that children do not grow or development at a consistent rate throughout life but rather through phases, through stages of development. Montessori described the stages of development as a rhythm of six year cycles, each cycle having an opening and closing phase. The first phase of each cycle opens up to a set of particular experiences and consequently to the related acquisitions and conquests, and the second half consolidates these achievements in preparation for the next cycle. The four planes of development include Infancy from 0-6, Childhood from 6-12, Adolescence 12-18 and Maturity from 18-24. The opening phase of infancy is from birth to three and the closing phase is from three to six. This puts the four year old in the closing phase of infancy. But what does this mean? The line of regression indicates the passage into the acquisitive stage when assimilation, refinement and acquisition of skills occur. I have especially noted this with Otis'. Since turning four I have really noticed a explosion in his fine and gross motor skills. The child who was learning to jump can now hop - backwards and forwards, the child learning to draw a complete circle can now write his name. In many ways this is a great age/stage for parents, the child is past the peak of the sensitive period and as these skills are refined it is a time where we notice the outcome. I see it as the consolidation period before the child enters the second plane. Montessori also wrote about this closing phase of infancy (3 to 6 years) as the time the child moves from the period of the 'unconscious worker' to the period of the 'conscious worker'. The child is now aware of what they are learning and are no longer unconsciously absorbing. "The mind's power to absorb tirelessly from the world is still there, but absorption is now helped and enriched by active experience. No longer is it a matter purely of the senses, but the hand also takes part. The hand becomes a 'prehensile organ of the mind'. So, from the age of three till six, being able now to tackle his environment deliberately and consciously, he beings a period of real constructiveness. The hidden powers he was previously creating are now able to show themselves, thanks to the opportunities for conscious experience which he finds in the world about him." - Maria Montessori, The Absorbent Mind. "The richness, the depth and the usability of the construction is a reflection on the support of the adults in preparing an environment rich in opportunities. The child must be left free to carry out this work without obstacles either from the adults or the environment. The child must be free to make his own mistakes and to adapt his behaviors to what is most supportive in living and doing. It is not the task of the adult to construct the child. It is the task of the child to construct himself, creating the man or woman he/she is one day to be! This is a critical period of time when the child discovers that the world is a marvellous, interesting place to know." Shannon Helfrich, The Conscious Worker. 10 Fantastic Montessori School Art Shelves! I know we have discussed that in a Montessori classroom art is not confined to art shelves. In Montessori classrooms art can be found on the science, cultural, botany, geography and nearly every shelf available. However most Montessori classrooms do have art shelves and I am interested to see what is on them! Here are ten fantastic Montessori school art shelves. These pictures do not do them justice, if you are interested please click on the links - many posts feature the shelves and trays in detail. 1. The Brilliant Child - click through for many classroom pictures. 2. Montessori Elementary Art Shelf featured on Montessori For Everyone. Click the link for close-ups and details of the trays. 3. Toddler Class at Canberra via How we Montessori. Love the open trays with the paint on them - it's inviting and ready for the children to use. The toddler easel is to the left and the art apron is on the right side hanging on the side of the shelves. 4. Art Shelf in a Primary Class via Pinterest. 5. The Brilliant Child - click through for many classroom pictures. 6. The Brilliant Child - click through for more art pictures and ideas. 7. The Natural Child - I have linked to this site many times, over and over it's always inspiring. Lots more pictures and close ups on the website. 8. This is preschool area featured on Montessori For Everyone. This blog post also lists good suggestions for materials for Montessori preschool art areas. 9. Art shelves via Living Montessori Now. The original source for this picture has been removed however I love their colour coordination and how they have use tubs to contain larger activities. 10. Montessori Art Shelf at Mission Montessori - "Each activity should be relevant and purposeful." A few more pictures from Montessori School environments that I find really lovely and inspiring; Flickr, Prague Montessori Children's House, Holiday Crafts (but still very beautiful art shelves) Montessori By Hand, Montessori By Hand. I've been wanting to try this idea for a while. An area where the children can hang their special feathers, leaves, photos, artwork, letters and postcards. A place where they decide what they want to hang (not the adult) and where they can hang it themselves. I think there is something to be said about not displaying children's art - not taking the focus away from the process and putting it on the end result. However there are many special items my children want to display. This is not about the adult making the decision and putting special or attractive art work on display and hanging it on the wall. This is not about the adult pinning up children's artwork out of the children's line of sight - it irks me to see children's areas where all the art is hung too high for the children to see. It is a place for them to put their things, where they can see it and where they can take it down. Without taping things to the wall and without using a pin-board. I have seen this idea in many classrooms. I was worried I couldn't handle the messy look, that it would be too eclectic for my taste. But in the children's little art nook it is perfectly in place. The net hangs from removable and clear command hooks. The net is a natural fish net which is available from educational supply stores for this purpose although I have cut it down to size. The children hang their items with little wooden pegs. I can't wait to see how it fills up and develops over time. Our new art area (nook) will be on Friday's What's on our Shelves link up. Is there enough art in Montessori schools? In each Montessori school we have attended there have been areas that I feel have been lacking. In Canberra I felt the children could do more cooking, baking and food preparation. Here in Brisbane I feel they could do more art. Our Canberra school had a specialist art teacher and regular art evenings. I know (and understand) the theory behind not having specialist teachers in Montessori classrooms however having a specialist teacher draws attention, focus and perhaps resources to a specific area. However as I have absolutely adored both schools and all of our teachers I simply compensate for these areas at home. We can cook and bake at home and we can create art at home. I cannot make up for not having access to an experienced art teacher but I can ensure my children are exposed to various art materials and we can learn techniques together. The key is to make it a focus at home and not let it get lost in the busyness of life. Over the next couple of weeks I am revamping our art area. We really have all the materials we need (although the boys used the last of the clay today) I just need to find a way of making it more accessible, more child friendly, more attractive. Perhaps having a focus of (but not limited to) one medium per fortnight or per month might work. I have seen collage, paint, markers and pencils in Montessori 3-6 and 6-9 classrooms. The collage materials have always been severely limited and the pencils and markers lack variety and often lack quality. I have not seen other materials readily available to the children. At school my children have not/do not have everyday access to clay, modelling beeswax, pastels, charcoal, mosaics, they have not tried marbling, handmade stamps, stencilling or any kind of printing or dyeing. Surely these are all appropriate materials for children at some point within the ages of three to nine. Art is not a part of their everyday school life. I don't want Montessori schools to push out cookie cutter crafts but I expect and wish for exposure to high quality and various art materials - even in the 3-6 and 6-9 classrooms. My question - is there enough art in Montessori schools? If not - why not, what is the barrier? We only made a few changes to our shelves this week. We included new crayons with paper, they are shaped like rock crayons and are handmade so I'm interested to see how much they are used/compare to the commercial crayons we have. I wonder if their shape will change the shading or approach to drawings. We refreshed our letter writing tray with new paper, coloured envelopes and stickers. Our Noctural/Diurnal Tray is out. Still on our shelves is the spiral paper cutting tray. This has been very popular and seems at the right skill level. I have been printing off new spirals everyday. The link can be found here. We have introduced a magnet tray. Everything in the tray is magnetic and is designed for experimentation. I put these items on a tray as Otis had them all out on a rug for a few days. We had some Frog life cycles materials out last week however I observed Otis playing with the models, I figure why not provide a nice environment for him to play with them in. Therefore some small world play incorporating the Frog life cycle models. This arrangement actually has allowed him to tell the story of the Frog lifecycle rather than just recite facts. This activity is labelling the part of the Garbage Truck (similar model here). Otis is still really pre-reading. We have lots of labels around our house and as he gets to knows the starting letter in a word, as long as it is in context he can work out what the word means. I love this for a Garbage truck interested child. I'm thinking we could also do this with our Fire Truck, Excavator and more. You can see last week's shelves here. Otis has just started using the BambinoLuk (Caspar has the MiniLuk) please let me know if you would like to know more about them from a Montessori perspective. So far they meet our approval. Please link up with a picture of your shelves! Link up can also include Instagram pictures!! There are lots of ways to display materials in a Montessori environment. In the home we have more freedom however the concept is similar to that of a formal Montessori environment (school or community), materials should be accessible to the child and easy to pack up and put away. Beauty and aesthetics are important. Some trays need to be food safe. Some activities the child will do in the tray and therefore the tray needs to be large and open. Some activities the child will do on a work mat and a basket or tray can be used for storage only. We love natural materials although most of us are on a budget. Handles are great for a young child. Sides on trays and wooden trays with handles are perfect for toddler environments. No Montessori environment is standard. They are unique and therefore variety, texture, colour and local influences are important. Here is a collection of baskets, trays and a jar or two that we love and many we use on our Montessori shelves. 1. Sommar 2015 Raspberry Tray. - Great food/fruit preparation tray! 2. Ensidig Vase. - Ok, not at basket or tray but we use these a lot on our shelves to hold bits and pieces, being clear it's easy for the child to find crayons, stamps or for viewing nature items such as seedpods, feathers, leaves, gum nuts! 3. Burken Glass Jar with Lid. Yet another glass jar that is an essential - the lid is easily removable and it is perfect for storing collections of little things such as buttons, threads, chalk. We also put play dough in ours and then put the jar on an activity tray. Also used in the bathroom to store homemade bath salts. 5. Smula Clear Tray. - For kitchen or water/sand work. 6. Sommar 2015 Raspberry Tray. - Also great for food/fruit preparation! 8. Druvflader Water Hyacinth Bowl. 9. Kastanjenot Water Hyacinth bowl. - I love this one, it's almost always on our shelves, it's nice and large and with the handles can be carried by a child, I love the white handles!! 14. Variera, Bamboo Utensil Tray. - A long rectangular tray. 15. Klack Rubberwood Tray. - A large tray with handles. 17. Bolga Baskets. These fair trade baskets can be found in many locations and are very useful for storing small collections, bits and pieces. 18. Mini Beech Wooden Tray. A very small tray good for storing one or two items of work. 19. Small Wooden Tray with Handles. This is a really great size for Montessori toddler and preschooler work. I don't think you can have too many of these trays - they are always useful. 20. Wooden Trays with Handles. 21. Wire Basket. I love that this is like a shopping basket. It makes it fun to use. 26. Wooden Tray - Five Compartment. - So many uses but naturally lends itself to sorting. 27. Sisal Nesting Baskets. - I love the natural look and the texture of these baskets. 28. Small Crochet Basket. - I love the warmth and texture of this little basket. I like the point of difference. It's nice to have lots of interest and variety on our shelves. 29. Crochet Basket. Again it's the handmade touch, a point of difference. Gorgeous colour and texture. 30. Large Coiled Rope Basket. I love rope baskets large and small. Again they help to add variety to our shelves and add warmth. We have a couple of small ones which hold pieces of puzzles and other items which fit in our activity trays. While the Etsy baskets are more expensive they are handmade and it's possible to purchase items that are made locally. Our crochet baskets were made in New South Wales by Chompa Handmade. I have also picked up lovely rope baskets at markets and independent artist stores. These cost more but I love the handmade and local element - having a story of finding them at a market or meeting the maker is a good experience. It's even better if you have a few skills and can crochet or make baskets or trays yourself! A basket collected while on holidays (or overseas!) can be a wonderful addition too! Montessori Services has a large range of trays. In the US Joanns has many trays and Michaels has many useful baskets. Our go to source for Australia made, local, hand-made trays is Wood Puzzles. Fair Trade stores like Oxfam always have an interesting selection of baskets and second hand/thrift stores can also have a good selection. Are your children interested in what happens at night? We are often out when it is dark. Last night we were at a park and were able to lie down on the grass and look at the stars and listen. We've gone for night walks with a torch just to see what we might find. I have never seen a Nocturnal/Diurnal Activity out at a Montessori school so I figure it might be a fun topic to discuss at home - at home we have the advantage and opportunity to observe our local nocturnal animals (possums on power lines anyone?). I selected animals that are primary nocturnal and from around the world. As this activity is for a four year old I have tried to keep it as simple as possible. There are a few activities listed at the bottom of this post that include crepuscular (twilight) animals. This was a really good activity as some of these animals are new to Otis (beaver, raccoon, hedgehog, scorpion) and he has had to learn about these animals to complete the activity. Otis pays a lot of attention to owls (this board game is a favourite and requires all owlets to be in the nest before morning). We haven't done a lot of work with owls but I can see an interest there. I have printed a small fact sheet to enable me to provide him with more information about this barn owl. There is no control of error although he knows there are ten animals in each category, if there is more or less than ten in each group the activity needs more work.